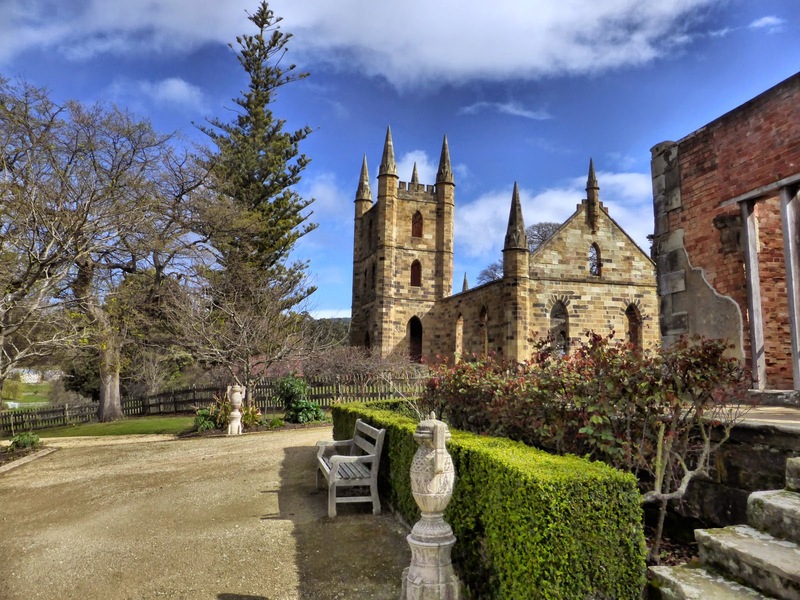 Day 9: Hobart to Port Arthur & back. 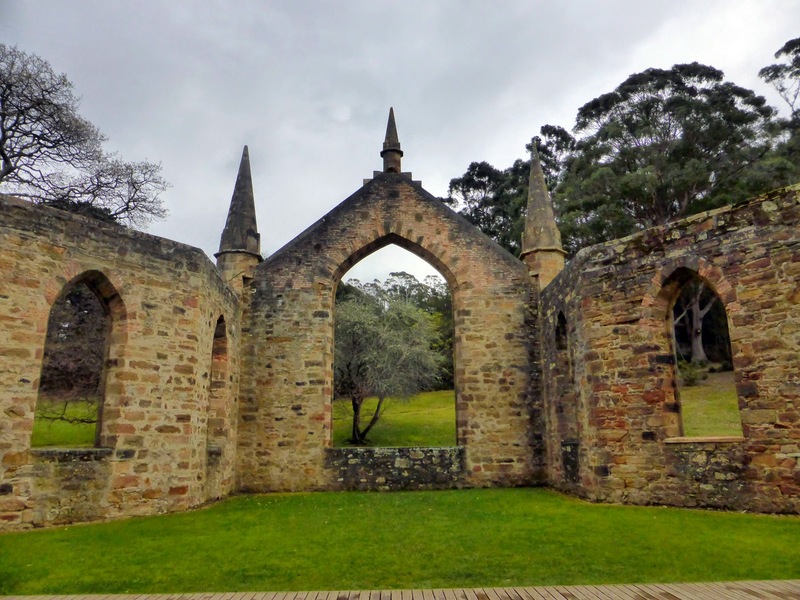 This morning we left the hotel to drive southeast to the Port Arthur Historic Site, an extensive reminder of Australia's origin as a penal colony. Near the town of Dunalley, we began to see unusual looking trees along the roadside. 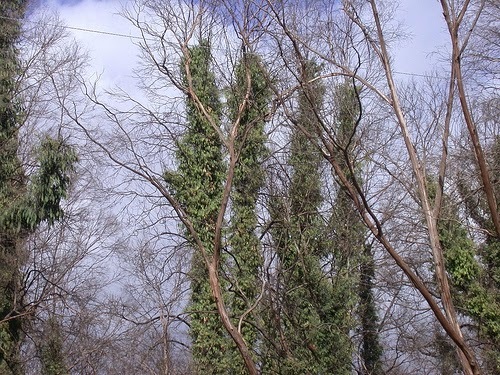 Though the limbs and branches had no leaves, the trunks of these trees were covered with short leafy stems, making them look as if they were coated in green fur. We surmised that the leaves were some kind of parasite growing on the trees and that its presence had killed the host tree. A bit later, when a road construction stop gave us the opportunity to examine the trees more closely, we realized they had been burned. When we finally discovered the truth, we learned that these, and all, eucalypts come equipped with epicormic buds, small regenerative agents that lie dormant below the bark. Damage from a bushfire in the area last year stimulated these little lifesavers to develop into active shoots, which will later become new branches and limbs for the trees. 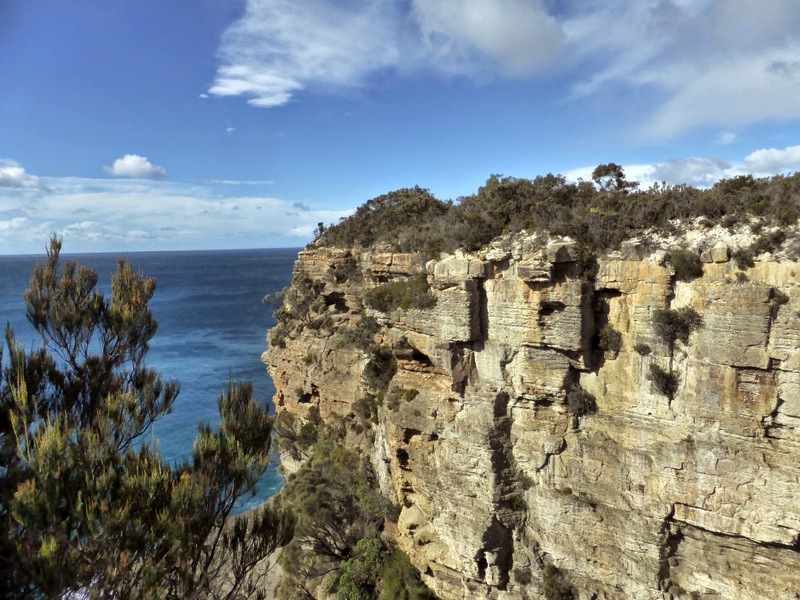 An accidental detour a bit further south took us into Tasman National Park, where we stopped at Eaglehawk Neck lookout over Pirates Bay and at the nearby 'tessellated pavement" along the shore. Created over a period of millions of years, this remarkable phenomenon resulted when layers of silt, compacted into siltstone, were cracked by stresses in the earth's crust. Erosion exaggerated the joints where the cracks occurred. Under water, salt erodes the surface more quickly than the joints, so geometric recesses appear. Out of water, sand and other particles erode the joints faster, creating loaf-like structures. 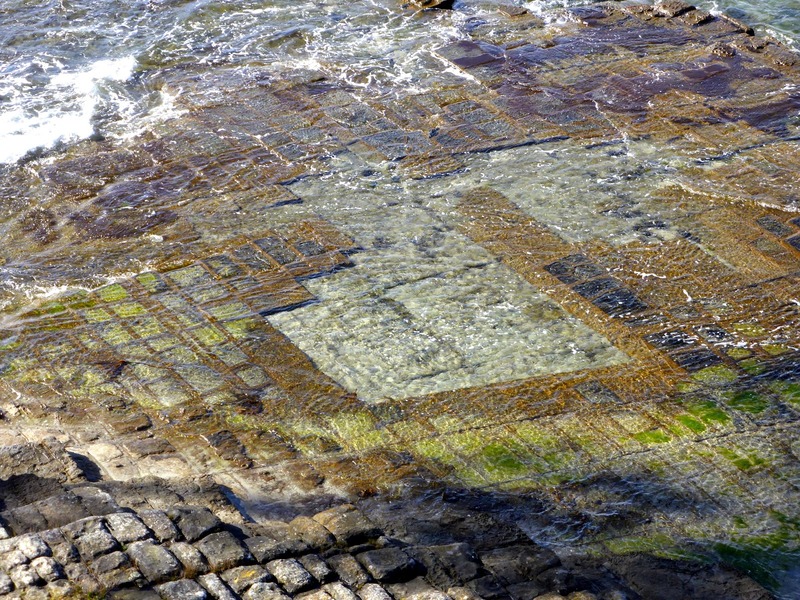 We had seen similar features near Sea Cliffs Bridge in NSW and were glad to learn the explanation. 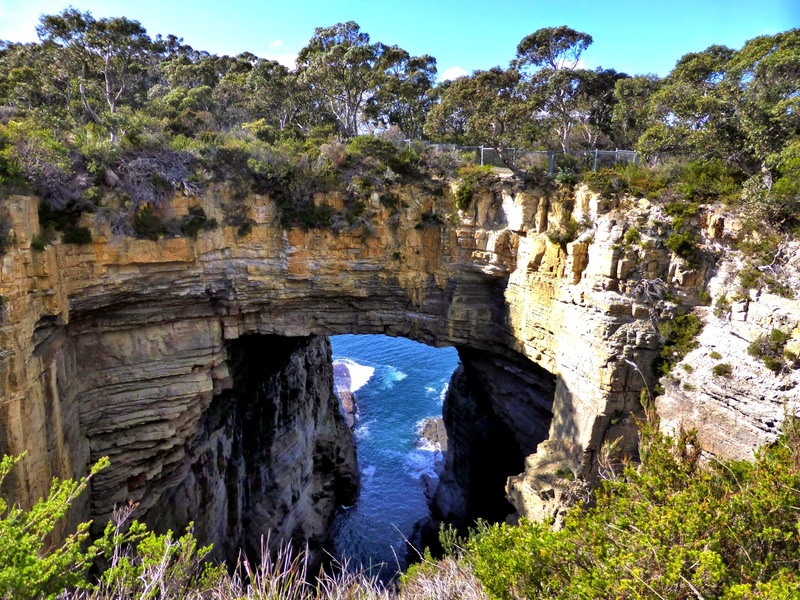 Persisting with our detour, we stopped at Tasman Arch, what's left of a large sea cave, created over thousands of years by wave action on the soft rock of the seaside bluffs. Eventually, the ceiling in the back of the cave collapsed, leaving a pit behind an arch. Back on track at last, we finally made our way to Port Arthur, Australia's most famous penal settlement, which operated from 1830 to 1877. During the 19th century, more than 165,000 men, women and children were involuntarily transported to various Australian penal colonies by British authorities due to overcrowding in their correctional facilities. 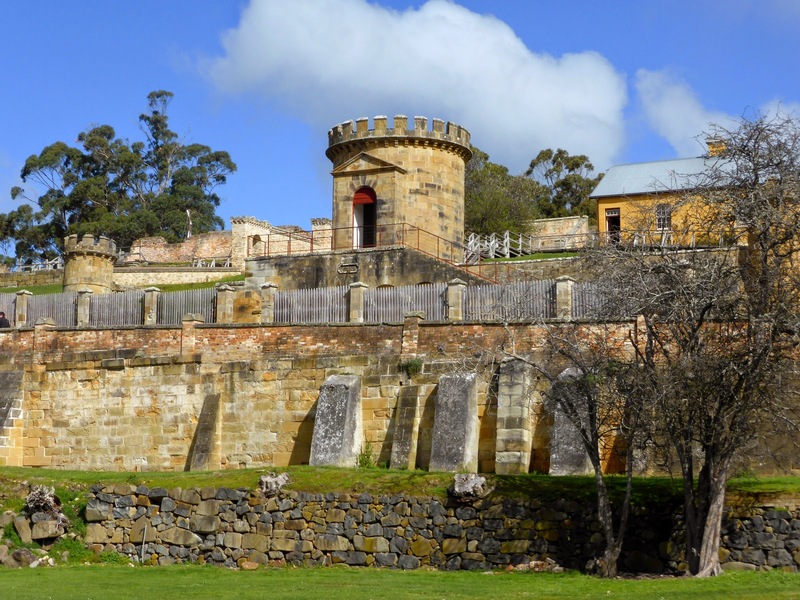 Built on Tasmania's remote Mason Cove and surrounded by dense forests, Port Arthur had a location that effectively discouraged escape attempts among a population of convicts who were, for the most part, non-swimmers. Though early convicts were housed in primitive timber huts, as their numbers increased, a failed flour mill was converted to a four-story penitentiary building. To shield them from criminal influence of the older prisoners, boys, usually between the ages of 14 and 17, were housed in a separate prison on a nearby island. Like their adult counterparts, boys were sentenced to 'transportation' for both major and petty crimes, which may seem harsh until you consider that by 1800, Britain had stipulated more than 200 offenses that carried the death penalty, most of them property crimes. Since children in that society were considered employable by age 5 and legally responsible for their own behavior by age 7, executions of children for minor thefts were not uncommon. The cost of admission included a harbor tour and guided walking tour of the site. In the visitor center, we sampled some local foods for lunch and found them to be quite tasty. Intermittent showers kept us off the walking tour but we did find time to search unsuccessfully for a letterbox planted on site. Another tragic chapter in Port Arthur history unfolded on a Sunday afternoon in April, 1996, when a young man, bent on revenge for his social isolation and determined to make himself famous, entered a restaurant and gift shop at the Port Arthur Historic Site and began a bloody killing spree that left 35 dead and 23 wounded, most of whom were Port Arthur staff and visitors. To honor the memory of those whose lives were lost in this massacre, a memorial garden was established incorporating the shell of the cafe and gift shop. 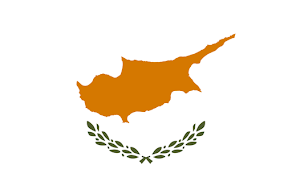 In response to this horrific event, Australian state and territorial governments imposed tight restrictions on automatic and semi-automatic weapons and heavy limitations on other repeating types of firearms. 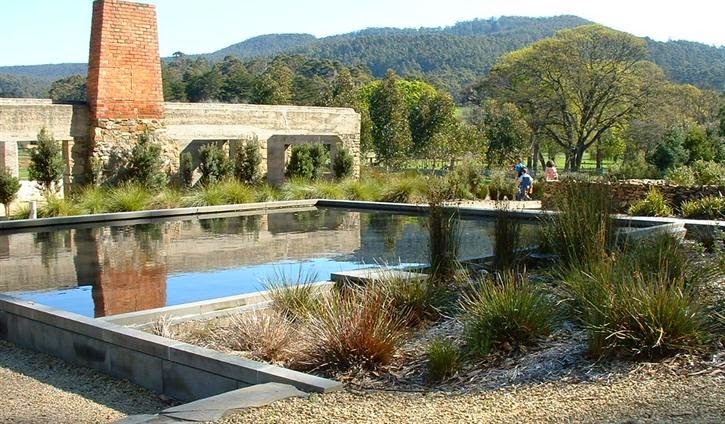 Tomorrow we plan to check out a famous view and hook up with some native Tasmanians. Though we have noticed nothing unusual about mailboxes in the cities we've visited in Australia, rural mailboxes are quite another story. We're not talking about a mailbox that looks like a fish or a tractor; these are mailboxes that are a helmet, or an old microwave oven, a milk jug, a tire. Apparently anything is eligible to be a rural mailbox as long as it has a slot in which to deliver mail. 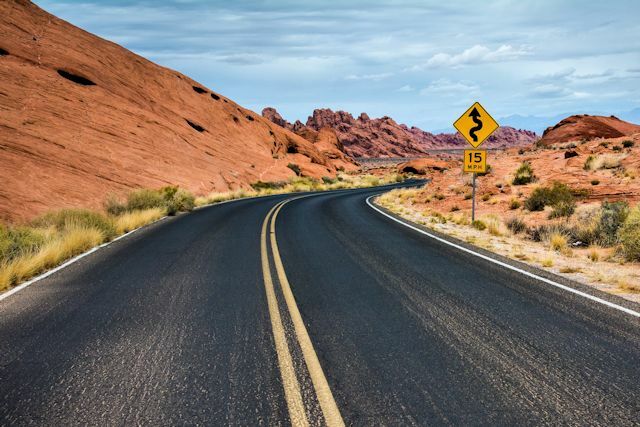 It's actually quite entertaining, as it gives one something to look for while driving down even the humblest of roads. Near the tessellated pavement, we saw this little guy in a battle with some birds. No, not a Tasmanian Devil. 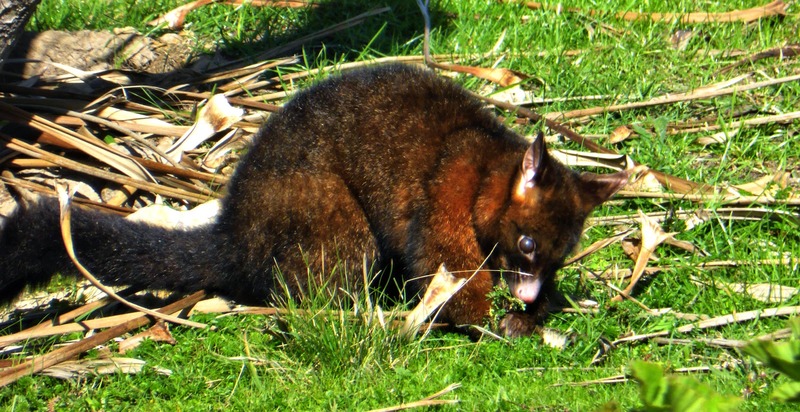 A brushtail possum. 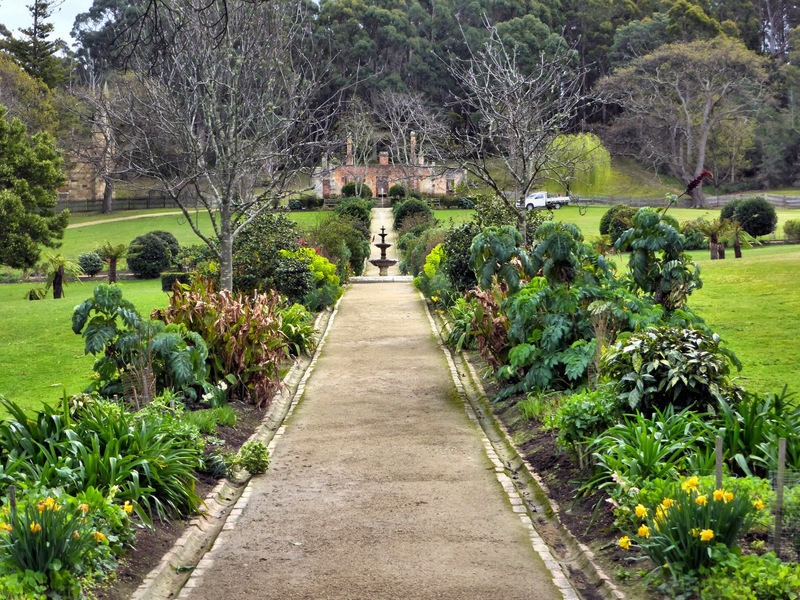 Lush gardens were developed for the enjoyment of the prison staff and their families who lived at Port Arthur. The Port Arthur church appears to be still intact. A different viewpoint reveals otherwise. 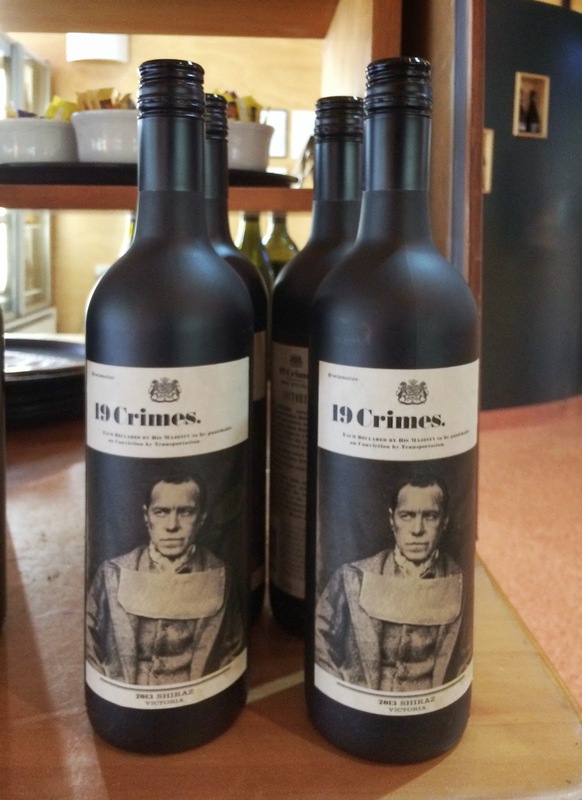 This wine in the Port Arthur restaurant may be taking a theme a bit too far.